When will NDIS be coming to the Gold Coast? The NDIS is scheduled to roll out to the Gold Coast Community from 1st July 2018. 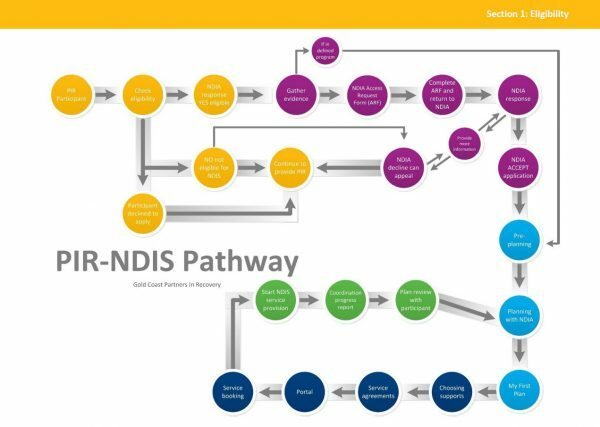 PIR is in the process of being integrated into the NDIS. This will be occurring as each Local government area is transitioned into the NDIS. You PIR Facilitator will be have discussions with you about your eligibility for NDIS and how PIR may assist you. What is the process for applying for an NDIS package? If you decide to apply for the NDIS, your Facilitator will walk you through the steps most relevant for you. As each package is unique to the individual, there are a number of items required to be completed before you can request access. What happens after I Request Access to the NDIS? Below is a diagram of the steps involved in the process for applying for the NDIS. If you have any questions, feel free to contact your Facilitator or send us an enquiry here, and we will try our best to assist you. What if I am a past participant of PIR? Am I still eligible to apply? Yes! We will be holding information sessions in 2018 to help you prepare your documentation to apply for a package. If you have any specific questions regarding your access to PIR support during the transition, please contact us here or you can email us at [email protected]. Have you seen the reimagine website? Supporting people living with mental health conditions to navigate the NDIS. Click here to access.